The owners of this property in Maesteg, a town in the Llynfi Valley not too far from Port Talbot, had decided after many years to remove the carpet covering the downstairs hallway. 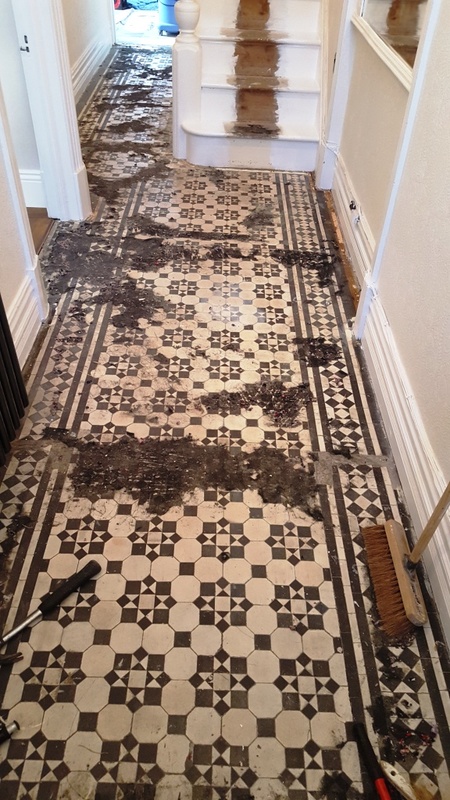 Upon doing so they revealed some truly fantastic patterned Victorian tiles, and decided that instead of replacing the old carpet with new carpet, they would restore the condition of the original flooring. 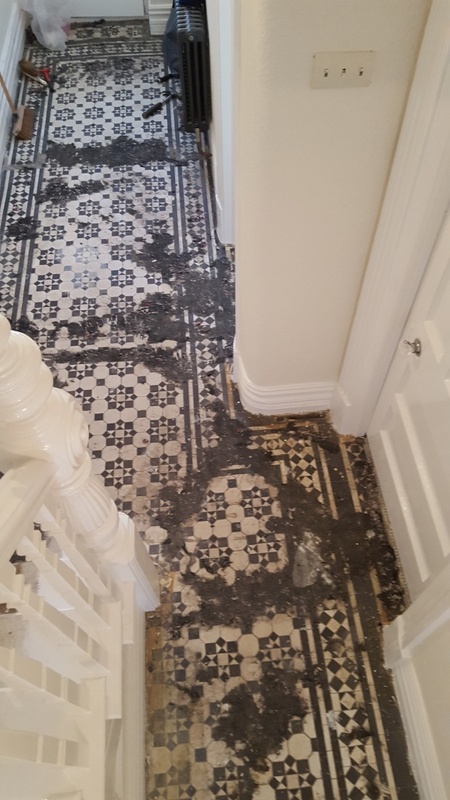 Whenever you remove carpet that has been hiding tiled flooring, it’s almost inevitable that you will find traces of rubber underlay, glue and cement deposits, and paint stains – or, in this particular case – a combination of all the above. The best course of action to bring original tiles back to their peak condition is to seek professional restoration. Everyday cleaning products and DIY methods rarely achieve the desired result. As the local Tile Doctor, these property owners contacted me to get the job done efficiently and effectively. Here’s how I did it. Upon arriving at the property, I started by checking the floor for any inherent moisture problems. This was important to do considering that the tiles appeared quite old; thankfully there were no major issues that would have affected the restoration. After checking for moisture, I began the cleaning process by manually scrapping off as much of the heavy glue and cement deposits as possible to clear the area and give the cleaning products an easier time of penetrating deep into the tiles. I then mixed a strong cleaning solution consisting of three of our products: Tile Doctor Pro Clean, Remove and Go and NanoTech HBU. Pro Clean is a reliable cleaner that cans be used on most natural stone floors, Remove & Go helps with the removal of glues, adhesives, and old sealers, and NanoTech HBU uses nano-sized cleaning particles to penetrate beneath tough stains, dissolve them, and lift them out. This solution was worked into the tiles using a rotary machine fitted with a coarse black pad, before I rinsed the floor thoroughly. Then, on my hand and knees, I carefully checked every tile for any additional paint splashes or other deposits, using a handheld scraper and wire wool in combination with Tile Doctor Grout Clean Up to remove any I came across. This cleaning method for this type of floor is generally always successful. After leaving the floor to dry overnight I returned to the property, once again checking for moisture. Happy that the floor was ready to be sealed, I applied six coats of Tile Doctor Seal and Go, which not only provides a protective layer but also gives the tiles to a beautiful low sheen finish. Seal and Go is best suited for use on internal, porous surfaces such as Victorian, Quarry, Sandstone and Slate. The two photos below show the outcome of the restoration. 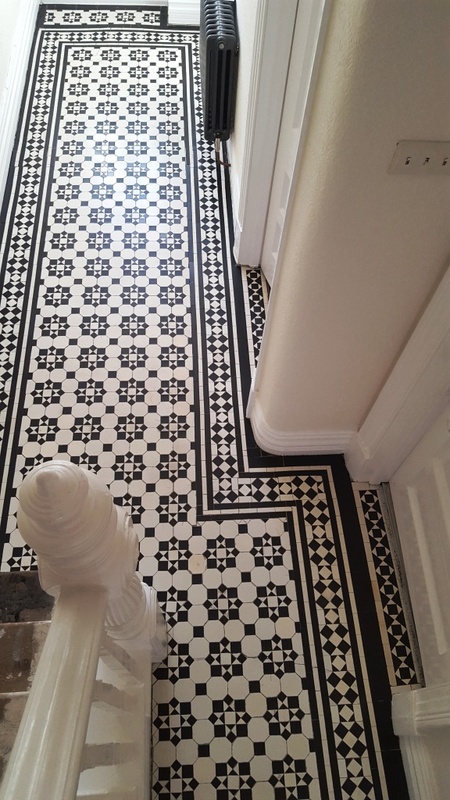 The transformation achieved in the space of one day was exceptional and needless to say the customer was over the moon with their new Victorian tiles. 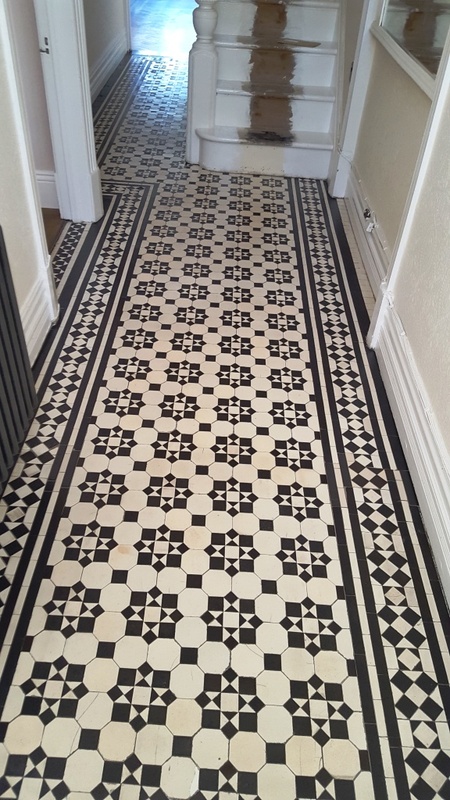 This entry was posted in Victorian Posts and tagged hallway, maesteg, South East Wales, tile cleaning, tile sealing, victorian tiles by AbzDominise. Bookmark the permalink. Julian Iacono is an agent of Tile Doctor, the largest Tile and Stone cleaning network in the UK who have developed the products and techniques to handle a multitude of issues surrounding tiled flooring including stone and grout.